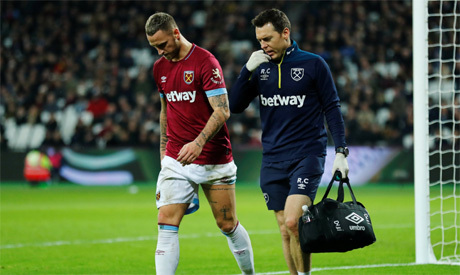 West Ham striker Marko Arnautovic has been ruled out for a month after pulling a hamstring in Tuesday's 3-1 Premier League win over Cardiff City, manager Manuel Pellegrini said on Thursday. The Austria international has emerged as a key player at the tip of West Ham's attack this season with five league goals in 13 games and Pellegrini said the club's other forwards had to step up during a busy run of fixtures this month. "Arnautovic has a muscle injury. He'll probably be out for around one month," Pellegrini told a news conference ahead of Saturday's game against Crystal Palace. "We know how important he is for this team. We know we have to play seven games in December and six games more in January." Midfielder Jack Wilshere will also miss Saturday's game at the London Stadium with an ankle injury. "Wilshere is not 100 percent comfortable so he won't be available, but it will just be for this game," Pellegrini added. "We have a squad and now is the time for other players to take their chance." Lucas Perez, who replaced Arnautovic against Cardiff, scored his first two goals for the club and Pellegrini was confident the Spaniard could lead the line. "I'm pleased because he's a player I brought in this season to this team," the Chilean said of the former Arsenal striker. "We know he's a good striker and the important thing is, when he has a chance, he takes it. With Marko's injury, we have Lucas in this position... We have Andy Carroll too. We hope he will play games in a row now." West Ham, who will be seeking a third straight win, are 13th in the table with 18 points, two places but six points above vistors Palace.